I play golf rather reluctantly and very poorly and to my mind it is a good walk spoiled – that was my comment on seeing Xanthippe’s title . Who said that? Oscar Wilde? Mark Twain? 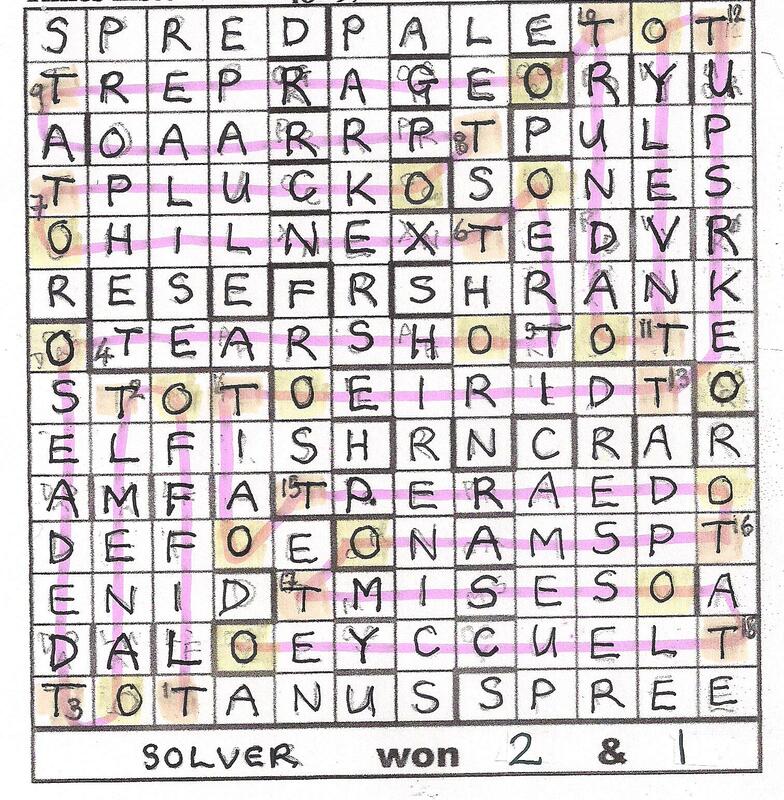 There seems to be some ambiguity – but, of course, quite some time later, we realized that Xanthippe was saying it too, and giving us a helping hand with the resolution of our scorecard by prompting us about which of the words in the clues to holes were the extra ones. We read down the first letters of Iron Seal Abbot Guns Of Over Debt Well Asks Low Kids Sees Punk On Iron Loci Eases Debut, and saw the quotation. That helped us solve the clues to the last of our holes and we were thus in a position to work out who had won this match. After an initial bungle where I would have been disqualified for handing in an incorrect scorecard, we managed to work out that we, the solver, had scored 9 and a half to Xanthippe’s 7 and a half after the 17th hole, so that we were two holes up with one to play. SOLVER won 2 & 1. Of course, there was still a hole to play (which Xanthippe won) before we could go to celebrate in the 19th hole and, reading through the clues as usual, to confirm that Xanthippe is still a member of the Tipply Listener Setters’ Club, I wasn’t really worried about the healthy lack of alcohol on the course. Indeed, Hole 18 made that clear – we had a ‘dry début’. However, we still had to construct our course. We were given the helpful length of the holes by the word length but we had to fill all the gaps and the acres of rough around the course by solving 26 more clues. We smiled when we saw all the golf references in those clues. Most of them yielded fairly easily. ‘Ted once before entering Stableford, taking out tense skilful pro (5)’ was a fine example. [STABLEFORD less T + ABLE + FOR gives us S………D into which we have to put PRE, giving an old word for TED = SPRED]. Four clues had us really puzzled, those to SONES (SCONES less C which Chambers tells us is 12 in hexadecimal notation), TOTE, SHRANK (which Chambers tells us is a word for ‘caught’) and TOTANUS (TEA produced that for me and I was relieved to find that it is a ‘red shank’ or a wader). Those clues, we thought, were considerably more difficult than the other relatively gentle ones. Since we could extrapolate the placing of the Holes, it wasn’t too difficult to situate the Course clues but when our course was almost complete, we had some rather disturbing jumbles to sort out with only the instruction ‘Every Hole answer must be treated in the same way to make the entry more representative of the course’. Hmmm! Head-scratching. It was a surprising course producing those amazing scores for a second-rate amateur like me but there seemed to be a lot of rather jungly jumbled rough until the other Numpty said, “Of course, you have noticed that every hole begins with a Tee!” What a delightful Xanthippe touch. Obviously that was why we had so many Os left in our jumbles, and, moving those to the end, we had a mere 13 holes left with pairs of letters to place. Those letter pairs didn’t spell ‘fairway’ or ‘bunker’ so we opted for the logical solution and placed them in the order in which they appeared in the words naming the holes and breathed a sigh of relief as we finally made it for that welcome G & T in the 19th. We had rather enjoyed our match and were full of praise for the astonishing amount of thematic material Xanthippe had managed to fit into this puzzle. What a fine compilation! This entry was posted on 13 November 2015 at 4:04 pm	and is filed under Solving Blogs. Tagged: Golf, Xanthippe. You can follow any responses to this entry through the RSS 2.0 feed. You can leave a response, or trackback from your own site.